let me show you some code from my testApp, please ignore all extra checks and trace statements. Yep use stage.stageWidth/stage.stageHeight and the rest idk man. 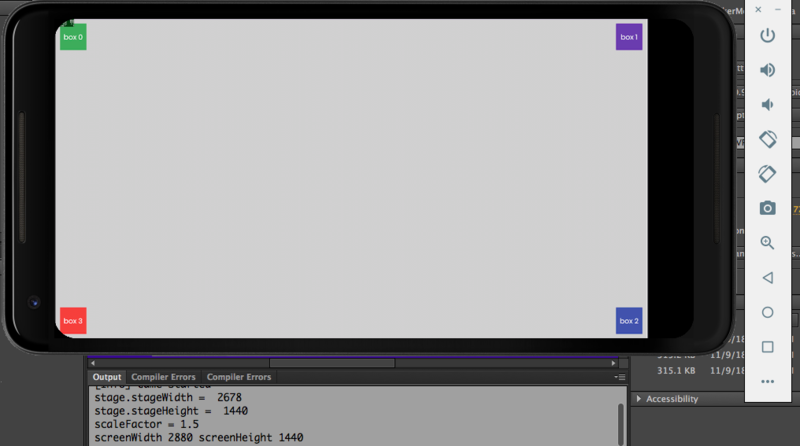 AndroidFullScreen.stage = stage; // this is the line that I meant that can give null pointers. As the ANE relies on stage.displayState as a fallback when the ANE context is not supported. Line 92, Column 23 1119: Access of possibly undefined property stage through a reference with static type Class. Line 93, Column 23 1061: Call to a possibly undefined method fullScreen through a reference with static type Class. Did u add the ane to the library path? And also the extension context... maybe some cache issue on the binary output folder? ane is correctly added, what is extension context? Yep, different values, yet the stage size for Starling is what matters to you... always use that one. Out of curiosity, what's the value for Starling.current.nativeStage.stageWidth compared to immersive mode ? Finally, I got it to work! Hey Shaun, thank you for your efforts and replies. Are you using this ane? If so, are you using the latest version? Do you still specify a value for android.max_aspect in your application.xml as suggested above Shaun or not for your solution? Thanks Shaun. In the meantime I have done some more testing (on an online service with real devices) and your solution fixes indeed the cut off problem. My app is in portrait mode and on taller devices like the Samsung S9 and the LG V40 thinQ, the screen is not fullscreen, there are black bars on top and bottom. But there is no more cutting off happening, the whole viewport is visible. In my test the android.max_aspect being there or not and its value didn't make a difference. I wonder if there is a solution to the cutting off problem without losing the full screen on these devices. Could you please provide a screenshot! Ok, i think this issue is there in LG V40 thinQ. We need somebody with this phone to test out and see if other app are also having this issue. Also could you please tell us which online service are you using to testing it! Well the V40 is just an example, I see the same behavior on a Samsung S9. I'm using kobiton.com to test. But I'm thankful the cut off problem is solved, it would just be nice if there was some sort of fullscreen solution for all devices.